For the preparation of a satellite mission realistic scenes of the future sensor are simulated. For this, at first realistic parameter fields as basis for the simulation of the bottom-of-atmosphere reflectance and top-of-atmosphere radiance have to be derived. 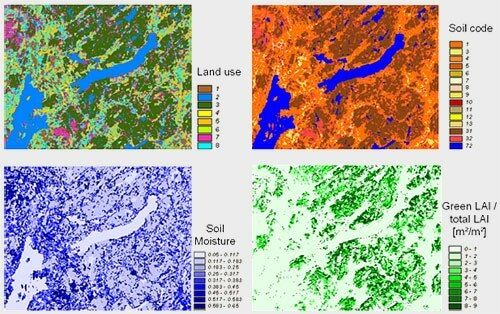 These fields represent the natural heterogeneity of the test-site. The spatial parameter fields are used as input for forward modelling. The spectral configuration of the future sensor is used for this. With the help of parameter fields different points in time and combinations of observation angles as well as different atmospheric conditions can be simulated. 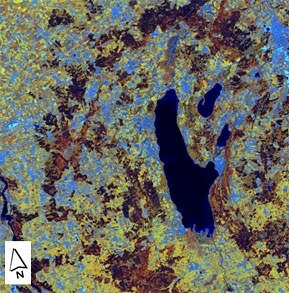 The examples are taken from work done for the ESA-satellite missions Spectra and Sentinel-3 as well as for the German mission EnMAP.